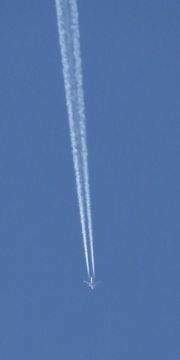 According to the chemtrail conspiracy theory, the trails you see in the sky behind certain aircraft contain unnatural vapor reported to contain chemicals. This theory has been written and talked about since around the mid 1990's. Chemtrails have been the subject of talk radio hosts, such as Jeff Rinse and Art Bell. According to Rinse chemtrails look like normal contrails at first, but they get much wider and are often set down in patterns. Normal contrails quickly dissipate, but chemtrails will open up wider and form together like a veil or a cloud that will last for hours. There are various ideas about the content and purpose of the chemtrails. One school of thought claims that it is a covert project designed to stave off global warming. Another claims that experiments in weather control are being done. Yet another holds that we are being sprayed with some sort of toxin from aircraft. According to an article in The Las Vegas Tribune, U. S. Air Force scientists working at Wright-Patterson Air Force base in Ohio, said that they had been carrying out two aerial spraying experiments. One involved aluminum oxide and was intended to reduce the threat of global warming. The other experiment involved barium stearate and was related to military communications. - "Chemtrails - Coming Out Of The Closet?" September 9, 2005. Critics say that it is normal for contrails to exhibit a wide variation in appearance and that the photographs and descriptions of the supposed chemtrails are just ordinary contrails. They also raise a question about how aircraft could pass through inspections without this being noticed. I am not here to convince you one way or another as to the true nature of chemtrails. I just want to share some information with you and let you make a decision or form an idea about just what is going on in our sky. Contrails- or 'Trails-con?' A comprehensive look at what the author considers "A hoax;" Includes a timeline. Weather Wars Weatherman Scott Stevens examines the chemtrail phenomena and man-made weather. Chemtrails911 Evidence of chemtrails: US legislation & patents, military reports, videos, photos, news articles.